These sliders. They’re one of the easiest things to put together, and also one of the most delicious – two things that usually don’t go hand in hand. I first made them for Andrew’s birthday party the year before last – the Dr. Seuss party. Everyone gobbled them up, and raved about them…so I knew I was onto something very good. We’ve been making them since. Sometimes I make homemade dinner rolls, and sometimes I pick up a package of King’s Hawaiian rolls at the store and call it a night. Then it’s just a matter of assembling the deli ham and cheese on the buns, then drizzling them in this delicious sauce…that’s hard not to site there and eat with a spoon. Bake in the oven for a few minutes to melt the cheese, and voila! I usually pair with a simple side like potato salad or sweet potato fries for an easy meal. 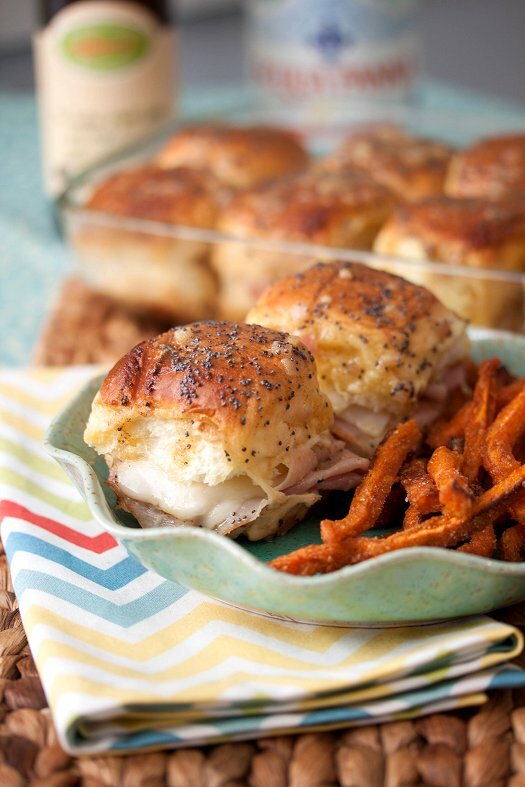 For lunch, dinner, or even as a munchie for game day – these sliders are always a winner that is sure to please everyone! Slice dinner rolls in half. Pile 1 1/2 pieces of ham onto the bottom of each bun, along with 1/2 piece of Swiss cheese and then top with the other half of the bun. Place in 2 quart baking dish. Repeat with remaining rolls. To prepare the sauce, heat the butter, brown sugar, mustard, Worcestershire, onion, and salt in a small sauce pan, whisking until smooth and melted. Drizzle glaze over sandwiches and sprinkle with poppy seeds. Cover pan with foil and bake at 350 for 10-15 minutes, until the cheese has melted. I have had these when you made them and they are amazing! Gonna be putting this on the list of munchies for Shane’s party! These look AhhhMazing! I think I could pound down about a dozen of these sliders! They’re the greatest thing that the internet has ever given us. No doubt. While making these tonight, I noticed that onion was in the instructions on how to make the sauce, but not in the ingredient list. These were very good, but how much onion was supposed to be added? Thanks for pointing that out, Sharon. I’ve corrected the problem! It’s 1 tablespoon of onion stirred in with the rest of the sauce ingredients. Sometimes I leave it out myself, no biggie! Hi there! These sliders look so good! I’ve been making something similar for these busy back-to-school nights and they are a lifesaver…I love the sound of this sauce you use over top! Oh, joy! These have been a staple at my family gatherings since I was a kid, and they’re still the first thing to disappear at potlucks these days. So good!! Love these, Laura! I’m going to add them to a holiday potluck roundup I’m putting together tomorrow if you don’t mind. Great recipe! I can’t wait to try!!!!! Laura you have done it again. These are delicious. I used smoke turkey. There are great! Taste so much better if you make earlier in the day and pit in refrigerator then bake for 20 mins vol on 10 mins off . I make a mixture of cream cheese, chives & a pinch of thyme and spread on the top of the bun when putting together. Bake for 30 min, or until hot and cheese is melted, covered. Uncover and bake another 10 or so until tops of buns are slightly brown. Sory I did not make it very clear that cr. cheese mix goes on “bottom” side of the top of the bun.